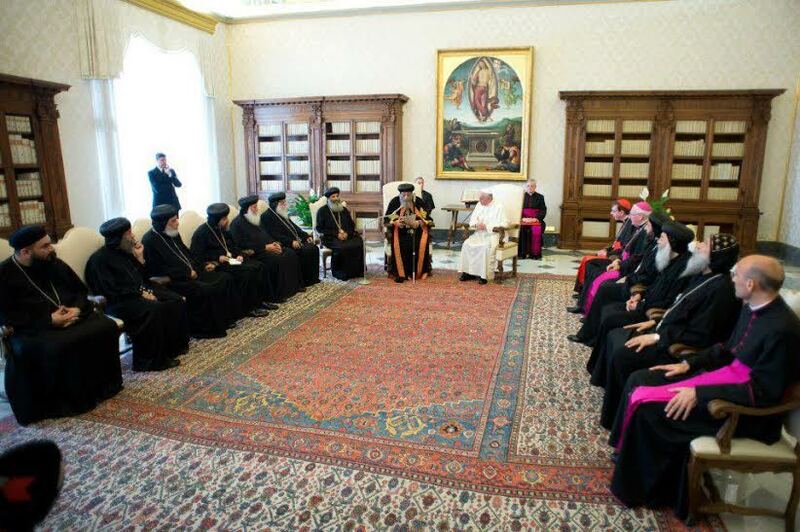 This week marks two years on the historic meeting in Rome between Pope Francis, Bishop of Rome, and the Coptic Orthodox Pope Tawadros II on 10 and 11 May 2013. This date in turn coincided with that of a visit made by Pope Shenouda III (Patriarch of the See of St Mark from November 1971 till March 2012) 40 years earlier to Rome, during which he met Pope Paul VI at the Vatican in May 1973. “Dear brother in Christ, Your Holiness Pope Francis, Pope of Rome, I take the opportunity to send you this message, upon the second anniversary of the “Day of Brotherly Love” between the Coptic Orthodox Church and the Catholic Church, on the 10th of May. First of all, I would like to send your Holiness the greetings of the people of our country and of our church, praying to God that this message finds you healthy and full of grace. On behalf of myself, and on behalf of the Holy Synod and the families of the 20 martyrs of country and church, whose precious blood has been spilled on Libyan land on the 15th of last February; I would like to extend our deepest appreciation to your Holiness for your kind phone call to offer us consolation, which confirms the bonds of fraternal affection and solidarity between the two churches. Pope Tawadros explained that the past year was full of events of special impact on Egypt, the Coptic Church, and pastoral care. He concluded: “We pray to God that peace and love may prevail throughout the world, and would like to conclude our second message of brotherly love with words of our daily life guide, the Holy Bible: “Greet every saint in Christ Jesus. The brethren who are with me greet you.” (Philippians 4:21). “As the second anniversary of our fraternal meeting in Rome is at hand, I wish to express to Your Holiness my prayerful best wishes for your well-being, as well as my appreciation for the spiritual bonds which unite the See of Peter and the See of Mark.